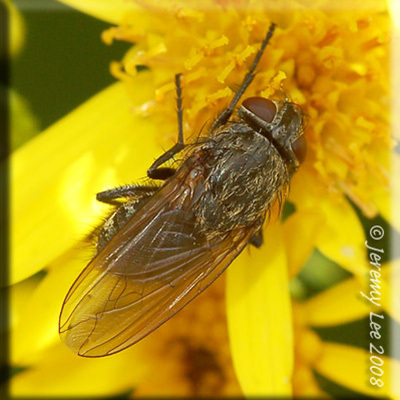 Pollenia rudis, more commonly known as the Cluster Fly, is a species of fly in the family Calliphoridae. P. rudis is also known as the attic fly, the loft fly, and the buckwheat fly. During the autumn and winter months, it can be found overwintering inside of attics or lofts. This sluggish species can be found “clustering” near the interior windows of a warm structure. During the summer, it can be found in fields and open areas. It is only when there is a sudden drop in temperature that the cluster fly shifts to the interior of structures, holes in trees, loose bark, or other crevices and cavities. Earthworms are a major source of food for their larvae. The adults are, in most cases, herbivores. They feed on many types of organic matter, plant sap, fruit, flowers and faeces are common energy sources. P. rudis is also attracted to malt extract, acetyl acetate and the proteins in animal meat.